Kererū (kūkupa, kūkū, New Zealand Pigeon, Hemiphaga novaeseelandiae), are large arboreal pigeons native to New Zealand. They can be found on the North, South and Stewart Islands and many forested offshore islands. The Parea chathamensis is found on the Chatham Islands. Kererū raise one chick at a time in a well-hidden nest of twigs. Both parents incubate the egg, which hatches after about a month. Over the course of a good breeding season, they might raise three chicks. The parents feed each chick a protein-rich “milk”, which they secrete from their crops, adding partially-digested fruit to their diet after a couple of weeks. Chicks leave the nest at 30-45 days old, but the parents continue feeding them for at least another two weeks. 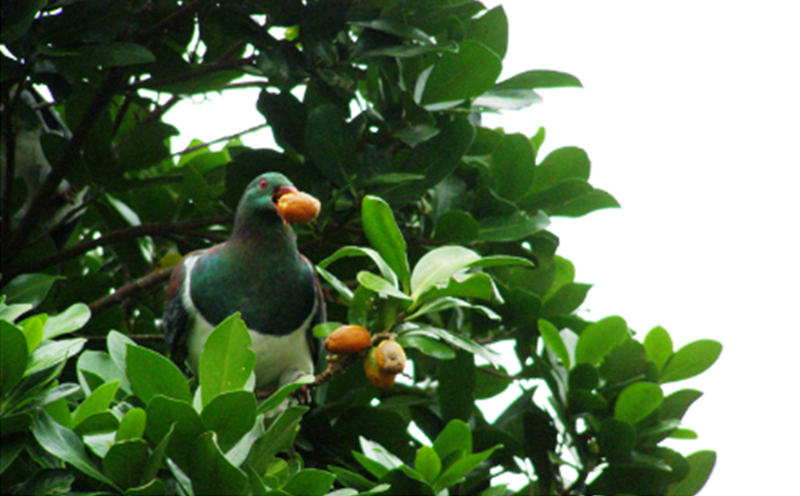 Kererū eat the fruit, leaves, twigs, buds, and shoots of over a hundred native, and fifty exotic, shrubs and trees. Occasionally, they gorge so heavily on ripe fruit that they become very full (or “drunk”) and have been known to fall out of trees. Kererū are very important to the survival of New Zealand forests because they’re the only birds left (all others are now extinct) big enough to swallow the large fruits of native trees such as taraire and karaka. After dining on fruit, they fly to a favourite roost to digest their meal. When they eventually pass that meal, they leave behind a dropping containing a seed and its very own package of fertiliser. This helps seedlings establish in new areas, and keep forests rejuvenated. 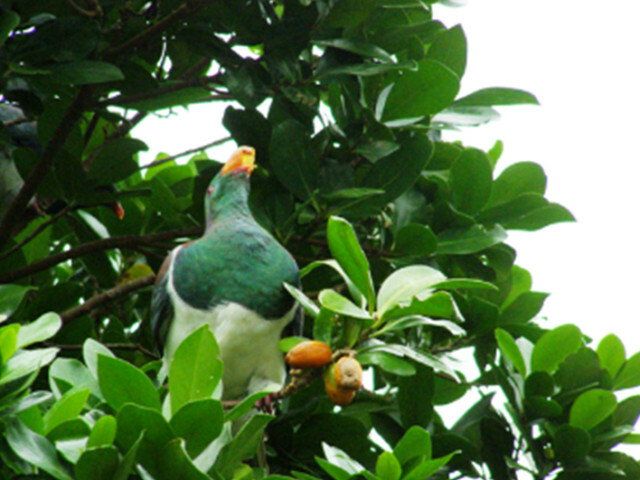 This role of propagator makes kererū a ‘keystone species’ of lowland forests. You can find a list of kererū-friendly plants for your garden here. 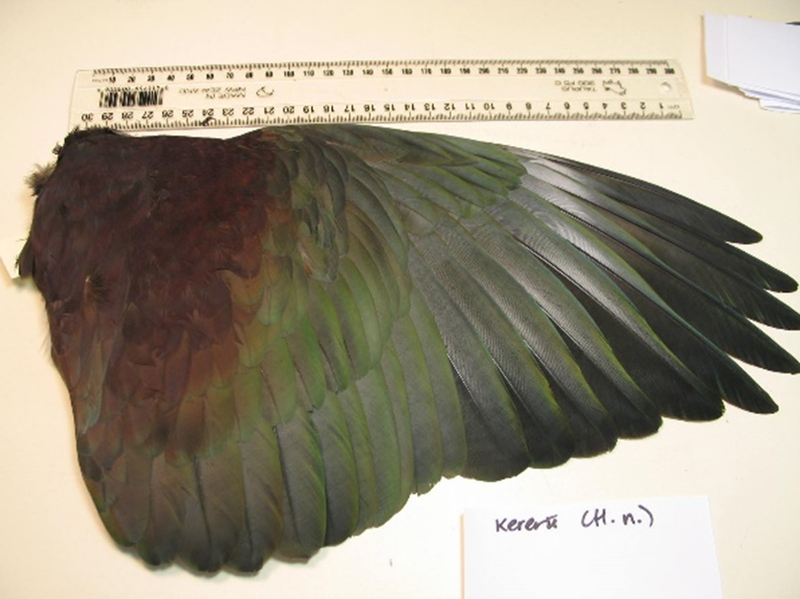 Kererū were once much more common throughout New Zealand. Until Māori arrived 1000 years ago, bringing Polynesian rats (kiore) and dogs with them, our native birds had never seen a mammalian predator. They were naive and trusting – many were flightless – and to this day, still have a strong smell that sharp-nosed introduced predators easily track. Kiore began a relentless slaughter that turned to annihilation when Europeans arrived. They introduced stoats, weasels, ferrets, cats, Norway and ship rats, mice, possums and pigs that found our native birds tragically easy prey. 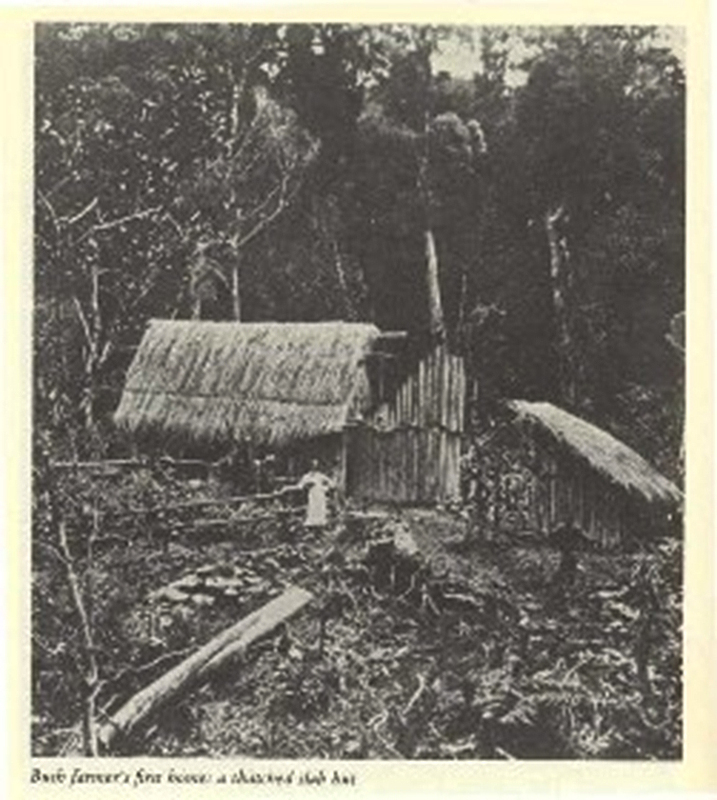 To make things worse, vast tracts of native forest fell to the axe and the match. Before the arrival of humans, some 90 per cent of New Zealand was covered in forest – a rich habitat for birds. The country split away from the ancient supercontinent of Gondwana before land mammals could reach it – originally, our only mammals were the bats that flew here, and the seals that swam. Today, only a tiny percentage of lowland forest remains. 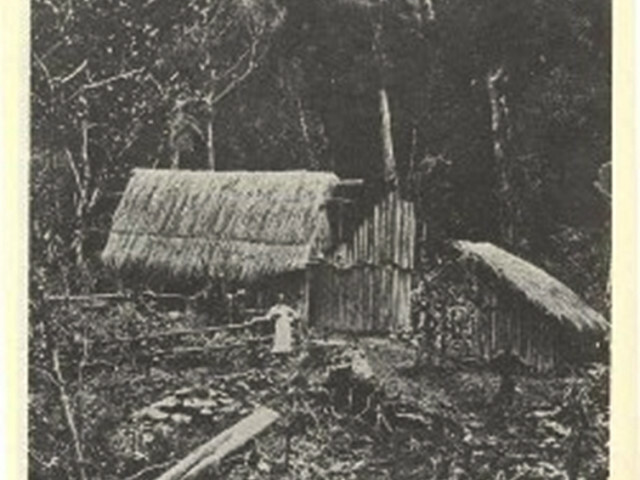 Fires lit by Māori destroyed some of them, but with the arrival of land-hungry European settlers, forest clearance laid waste to vast tracts of priceless habitat. In 750 years, half of New Zealand’s vertebrate fauna disappeared. At least 51 birds – a third of New Zealand avifauna – three frogs, three lizards, a freshwater fish, four plant species, and an unguessable host of invertebrates are gone forever. Much of our wildlife, including kererū, could yet follow them. DOC recognises 2700 native species as being at risk of extinction, yet actively manages just 10 per cent of them. Habitat loss has forced kererū into small remnant patches of bush, as well as urban parks and gardens. In an intact ecosystem, a kererū might expect to live for 20 years or more. Currently, they survive, on average, for around five years before falling victim to pests, cars or collision with windows. This represents a huge loss to the breeding population. 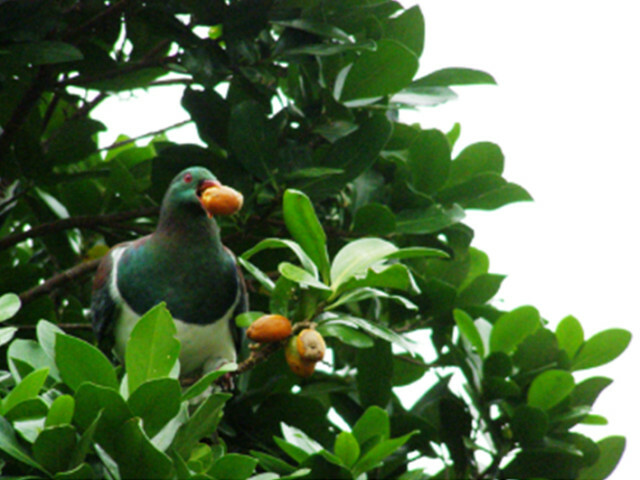 Initiatives such as the Kererū Discovery Project have recognized the importance of kererū as a keystone species. Over the last 25 years, projects led by community groups, local councils, the Department of Conservation and private individuals have helped their numbers increase. You can find some of the main ones here. Increasingly, these projects recognize that urban gardens are critical to the survival of kererū and other species. Māori have an enduring relationship with kererū that goes back to the arrival of the first canoes – a spiritual connection that transcends mere sustenance. 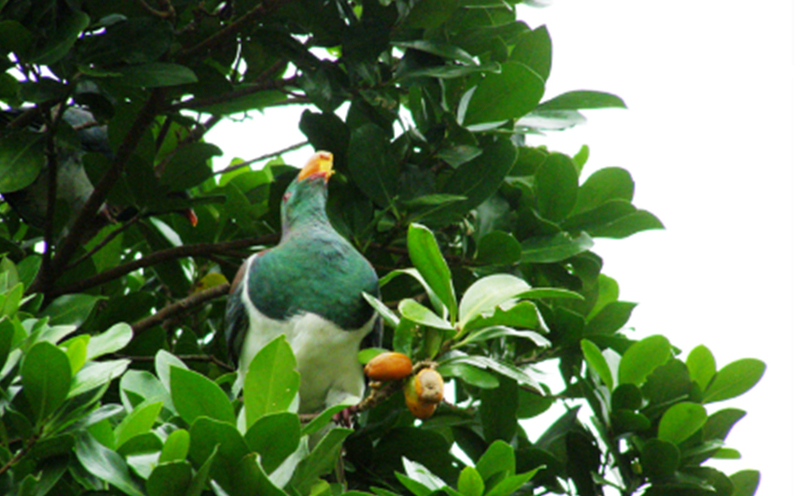 Iwi in former kererū strongholds – Ngāpuhi, Ngāti Hine, Tuhoe, Ngāti Raukawa, Ngāti Porou, Ngāti Tūwharetoa, Whanganui, Te Ātiawa, and Ngāi Tahu – hold a particular reverence for kererū, which features frequently in tribal myths and lore.